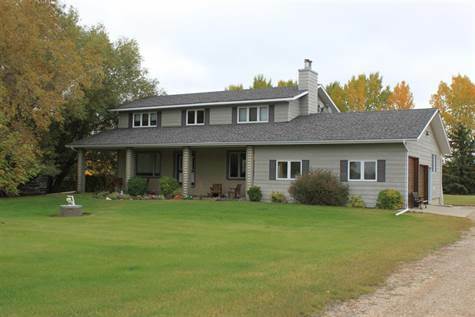 Enjoy benefits of acreage living on this beautiful property minutes south of Biggar Sk on HWY #4. The property includes beautiful 2,304 sqft 2 storey home, shop, cold storage quonset, and 139 acres of land! - Built in 1986, enjoy over 3,600 sq ft of developed living space in this 2 storey home including the finished basement! - The main floor features a beautiful oak kitchen, built-in writing desk, recently updated countertops and stainless steel appliances. The adjoining dining room features French doors leading to the 16x28 cedar deck (with natural gas BBQ hookup) overlooking the beautifully landscaped backyard. Adjacent to the dining room is a large sunken living room. - The den features an energy efficient brick fireplace and west facing window overlooking the covered patio and front yard. - Completing the main floor is the laundry room, 2-piece bathroom and large mudroom with access to the attached 2 car garage. - The grand foyer off the front entrance leads to the 2nd floor and the master bedroom, complete with walk-in closet, jetted tub, and a recently renovated 3 piece ensuite. Down the hall are 2 additional bedrooms and a 4-piece main bathroom. - The finished basement has a 4th bedroom, L-shaped recreation room, 3-piece bathroom, den, storage room, and utility room. - This home is very energy efficient, with 2x6 construction with an additional 2 inch styrofoam insulation under the siding, triple pane windows, and 1 foot thick concrete foundation. In-floor heat (boiler new in 2018) with 5 zones throughout the house. - The mature and well established yardsite includes 7,400+ trees planted over the past 35 years, including blue spruce, scotch pine, caragana, choke cherry, poplar, and birch plus many more! - The sheltered backyard includes a 2-tiered flower bed along the deck, garden area, and sheltered firepit perfect for family get togethers! - The corrals have not been used for several years, however include 2 watering bowls, a 3 sided cattle shelter, and an older pig/chicken barn. - The 139 acres includes approx 100 acres of pasture and 30 acres of hayland. Power is trenched to the large dugout north of the yard. Call today to view this beautiful property!